“Battlefield Earth,” opens with a conviction that 1000 years of Earth’s existence has been commanded by a race of aliens called the Psychlos, who support dreadlocks and look like they could be futuristic members of ZZ Top. The big mystery behind all of this is not “how” or “when,” but “why”—why would aliens that are described (more accurately, fabricated) as databases of intellect want the human race under control? What have we ever done to them? Better yet, why do filmmakers continuously encourage stories like these, where the questions never cease and gradually grow larger? Travolta is Terl, a member of the elite Psychlos alien race who has been appointed to head of security at the alien base on Earth. The year is 3000 (ever notice how futuristic films take place at the dawn of new millenniums or centuries? ), and Terl is generally unhappy with his position. But he cannot do anything about it because orders come from Home Base. When a human prisoner is brought in after being captured in nearby mountainous terrain (the poor unfortunate man here is played by Barry Pepper), Terl is inspired, I guess, to occupy his time by stealing all sorts of gold for himself. Branching from this premise are several equally-stupid subplots that, at one point or another, will have audience members staring on in utter discomfort and anger. There’s more to the flaws than that, though. But to conserve possibly valuable time, I shall describe its other inadequacies without any hesitation. The story is bloated and inane and lacks tremendous details. The characters are as complex as a tube sock. The cinematography is overly swift and indistinct. And the conversational tone is like listening to Howard Stern on helium, with each member of the Psychlos speaking in this irritable voice that has the same effect as scraping fingernails across a chalkboard. This only adds to our frustration, though, from them referring to us humans as “man-animals.” Exactly what is the significance of the “man-animals” label, anyway? I scribbled a couple of possibilities down on a pad of paper, but the mind went blank without much thought. Sitting through this endless pile of crap, I can guarantee my mind wasn’t the first thing to give out, either. There is no problem with sci-fi pictures in which humans are the target of a takeover by creatures unknown to the world. But there are some really really bad ones like this out there, and they should be targets in shooting galleries. 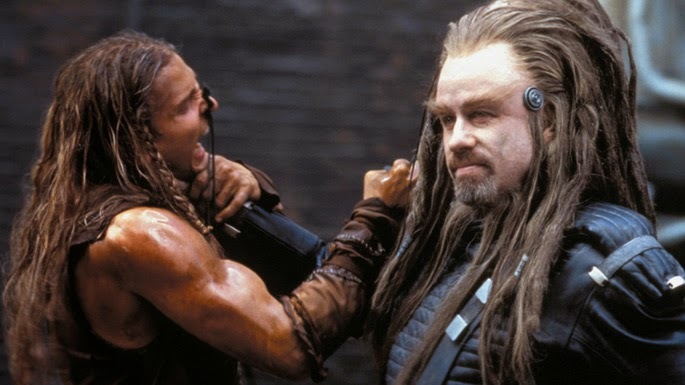 Like “Independence Day” and “Mars Attacks,” “Battlefield Earth” bathes in a pool of utter ridiculousness and cheesy visual styles, then stands up expecting everyone to admire it. At least with the other films, something actually happened in the two-hour running time.